I love the big soft pretzels that you can buy at the mall or at your favorite ball games. I love the chewiness, the flavor… let’s just say I love everything about these pretzels. So needless to say when I saw a recipe for pretzel sandwich buns on Pinterest I had to make them. I made them to go with my shredded chicken from my last post. Since I had the chicken in the crock pot it freed up some time so that I could make these amazing buns. 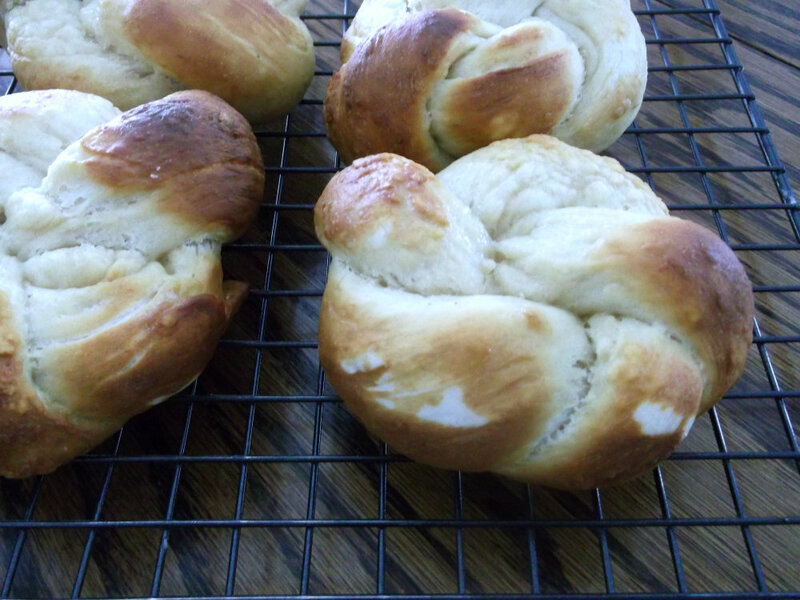 They turned out to be not your average soft fluffy bun, but they reminded me more of those big soft pretzels. Nice and chewy and a great flavor. We had a few leftover so we heated them up a little the next night slathered them with some butter and they were still scrumptious. 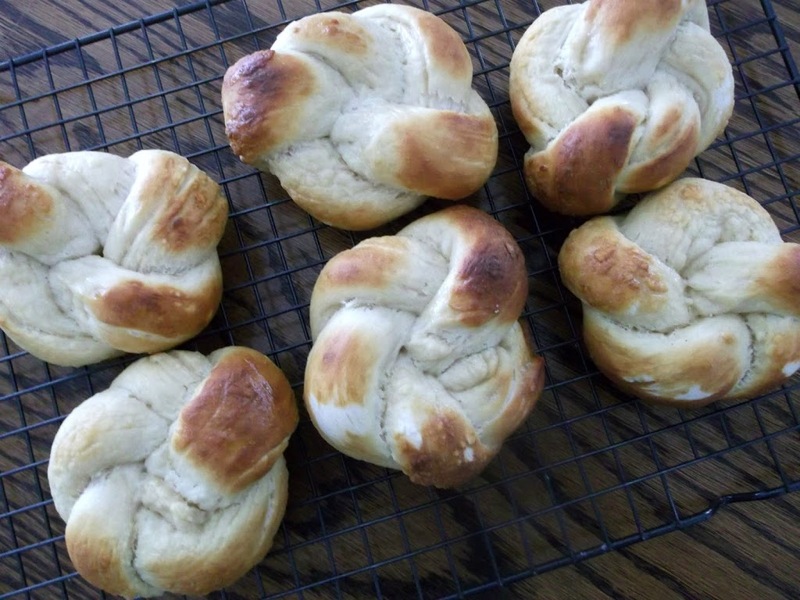 The recipe tells you to make long ropes with the dough and tie them into knots. Mine to be truthful were not as pretty as the picture on the original recipe; I guess I have to work on my knot tying skills. I am including the link so that you can see how to do the knots here. 1. Place all of the dough ingredients into a bowl and mix until well combined. Knead the dough for about 5 minutes, until it’s soft, smooth and quite slack. Oil the bottom of the bowl and turn to coat both sides of the dough, let it rest for 45 minutes. 2. While the dough is resting, prepare the topping: combine the boiling water and baking soda, stirring until the soda is totally dissolved. Set the mixture aside to cool to lukewarm (or cooler). 3. Prepare a baking sheet by light greasing it. 4. Transfer the dough to a lightly greased work surface and divide it into six equal pieces. Shape the pieces into rough logs about 6 inches long. 5. Allow the logs to rest, lightly covered for 15 minutes. 6. Roll each piece of dough into a 15 inch rope, and tie each rope into a square knot. Tuck the ends of the rope into the center of the knot to make a round bun. 7. Pour the baking soda/water into a 9 inch round cake pan. Place the buns in the pan, spooning the water over their tops; leave the water for 2 minutes before placing them on the baking sheet. This baking soda/water bath will give the buns a nice, golden brown color. 8. Allow the buns to rest, uncovered for 30 minutes, while preheating the oven to 450 degrees F.
9. Bake the buns for 5 minutes. Tent them with aluminum foil and bake for an additional 5 to 8 minutes, or until they are golden brown and feel set on the bottom. (Do this when you pull one out of the oven and carefully poke its bottom). 10. Remove the buns from the oven. Brush them with melted butter, if desired; this will give them a soft, buttery crust. Serve immediately; or cool, then wrap in plastic and store them at room temperature for several days. Freeze for longer storage. I know what you mean. I’ve been living in Berlin for 6 months now and I eat them all the time. I made them only once (it’s in each bakery around) and I know how delicious it is! My kids would absolutely love these. Definitely trying them soon. I am a lover of those pretzels too! These look irresistibly good! Especially with that chicken. I love pretzel rolls! These look delicious! Yum! My youngest is home for Easter and he loves homemade pretzels. If I have time, I’ll give these a shot. 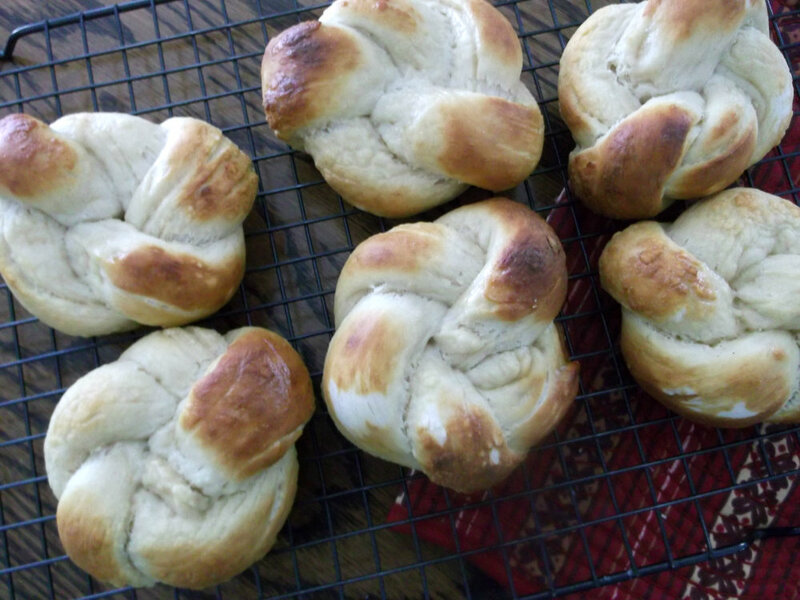 I just made some rolls using that same rosette technique…it looked so much easier on the video! Yours look so yummy! I love these! Pretzel rolls/buns/bread has such great flavor. I’m a sucker for those big, soft pretzels too. I keep meaning to get around to making these, but never do. I’ve had that King Arthur recipe bookmarked forever! Someday, though, I will. Thanks for the inspiration.